Today I tackle a new change at Apple that could affect you in several ways. A great off-the-cuff podcast today looking at the changes to Apple’s subscription policy. 2) Turbo Tax: Love ’em or hate ’em? – Not the best place for complicated private questions, and who loves doing taxes? Sample tweet: Filing your taxes tonight? Take a look at these awesome videos on tax basics we’ve got going on. Really? You have AWESOME videos about tax basics? AWESOME? And they’re about a couple taking care of their elderly mother and whether they can claim her as a dependent on our tax return? Verdict? The videos are NOT awesome, but, they are well-produced and the host is adorable (11 second mark). Really? You want to do your taxes on a tiny device? Something you do once per year? And with AT&T you can’t even keep a signal? Do you NOT have a computer? 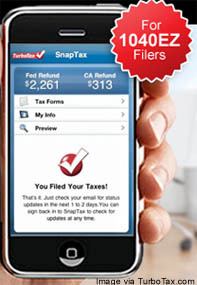 – But then I looked and saw the actual TurboTax iPhone product, called SnapTax. Turns out, it’s for the 1040EZ form only, and all you do is take a photo, answer a few questions, and send it in. OK, so do I STILL think this is a product that the universe needed? No. But who knows … maybe it’s a new generation thing. Everyone has a phone. Everyone has gone digital. For a younger generation, or for someone that is too lazy to use a computer or snail mail once per year, yes, I guess it SEEMS to make it easier. The topic is around Apple changing their in-app subscription terms. It’s a little hard to explain, check out Ars Technica or Wired for a better summary if you’re not familiar with the story. Anyone who sells subscription-based content outside the App Store must also use Apple’s system, giving Apple a 30 percent cut. Subscriptions offered within iOS apps must be the same price or less as the company’s other offerings, and the apps can no longer link to an outside store where users can purchase content. So does that make Apple a bully? 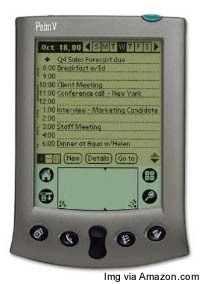 – I tell the funny story of my first business trip to New York, hailing back to the days when I tried to buy a then-state-of-the-art Palm V organizer. Oh, how far we’ve come with our smartphones. 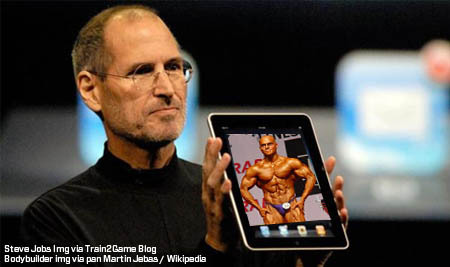 – My point is that Apple can be seen as a bully, using their monopolistic angle to say “Don’t want to play in our sandbox? Fine. Leave.” It puts publishers and other companies in tough spot, forcing them to alter their revenue models. starting to roll out Android versions of their apps. What might happen next — and is already happening in some cases — is that developers will skip the iPad altogether and focus on creating Android-based apps, or programs in HTML 5. Or is App just using their position as a superior brand? – Here I tell the story from my ESPN days. I was always on the ESPN.com side, but I was invited to work a booth at a trade show for the Cable TV side of things. A coworker pulled me aside before we started and said, “By the way, everyone here hates us.” I asked why, and he said that ESPN used the strength of their brand to ask for incredible increases in their programming fees every single year they renewed. The cable companies were in a bind. Because the overwhelming majority of their viewers stated that ESPN’s channels were far and away the #1 reason they subscribed to cable in the first place, they had to pay whatever ESPN asked. – The interesting case there, is that it was the content provider, not the delivery system, that had the upper hand. – However, some developers are happy to go along and play the game. They realize that Apple is providing the infrastructure (iTunes), the hardware platform (iPad), the users, the marketing, and the credit card payments system for them. You just have to make a great app. And for that reason, while they don’t like giving away 30% of their profits, they understand why. – Personally, these two graphics say it all for me, and why I will be developing an app for the iPad, not Android. 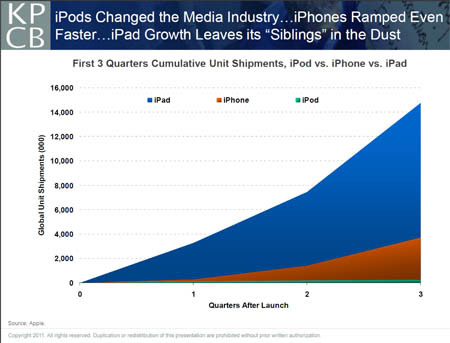 Source: They are from analyst Mary Meeker’s slideshow regarding Mobile trends. I mean, seriously. Look at that freaking graph. 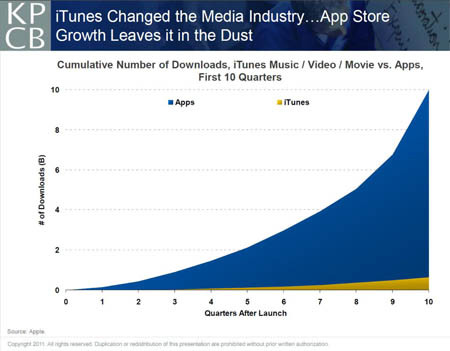 You thought downloading songs on iTunes was huge? You thought everyone you knew had an iPod? You thought people bought the iPhone at a fast rate? Look at what the iPad has done, and how the app world has exploded. This entry was posted on Friday, February 25th, 2011 at 3:45 am and is filed under Apple, Branding / Advertising, Social Networking / New Media. You can follow any responses to this entry through the RSS 2.0 feed. Both comments and pings are currently closed.